The observation is part of his essay, “Toward a Pragmatic Version of Memory,” which appears in a remarkable book titled “Unearthing Franco’s Legacy,” recently published by the University of Notre Dame Press. 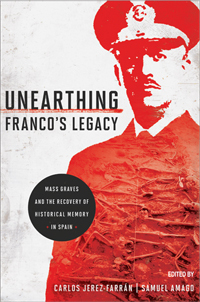 Edited by Carlos Jerez-Farrán, professor of Spanish and fellow of Notre Dame’s Nanovic Institute for European Studies, and his former Notre Dame colleague Samuel Amago, now associate professor of Spanish at the University of North Carolina, “Unearthing Franco’s Legacy” is an anthology of historical, literary and journalistic essays concerning the discovery and exhumation of the mass graves of the Franco regime’s mostly anonymous victims nearly three-quarters of a century after it came to power. The book is the product of an interdisciplinary symposium organized by Jerez-Farrán and held at Notre Dame five years ago. If its variegated participants had anything in common, it was a principled opposition to “the pact of silence,” the repression of collective memory beneath which the ancient wounds of a nation, people and culture continue to fester. Originally published by Michael O. Garvey at newsinfo.nd.edu on June 24, 2011.